WRAP-UP: Kosovan Rexhepi top-scorer, seven teams have best players, female coaches recognised. With the conclusion of the Women’s 17 EHF Championship in FYR Macedonia on Sunday evening in Skopje, the All-Star Team featuring the very best players has been announced. Seven different nations have had players selected with the Most Valuable Player (MVP) award going to Ema Hrvatin for Slovenia. 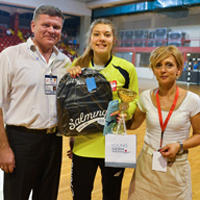 The Women’s 17 EHF Championship in FYR Macedonia saw two teams present coached by women and in recognition of this, the EHF Women’s Handball Board presented Julijana Damchevska (MKD) and Agnieszka Truszynska (POL) with a special, personalised hooded sweatshirt from Salming Sports AB, the official outfitter of the EHF and EHF Marketing GmbH.